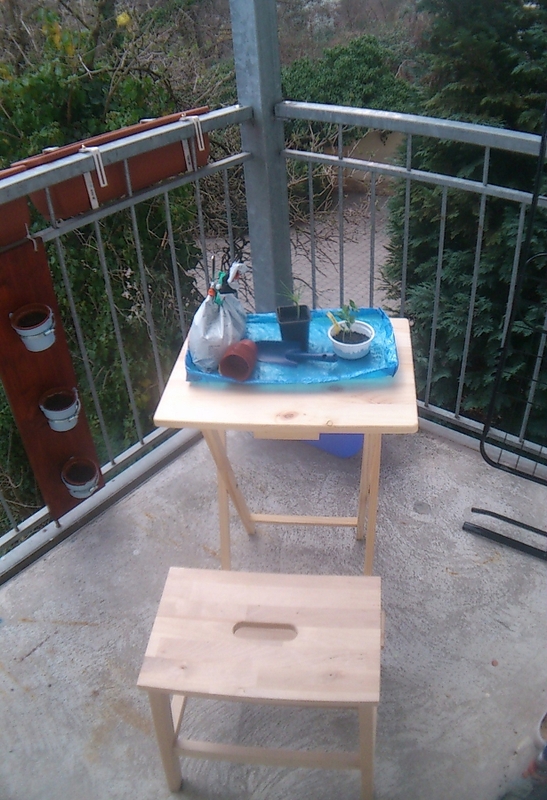 I got myself a coffee table for the balcony which I can also use for re-potting and other jobs like that. 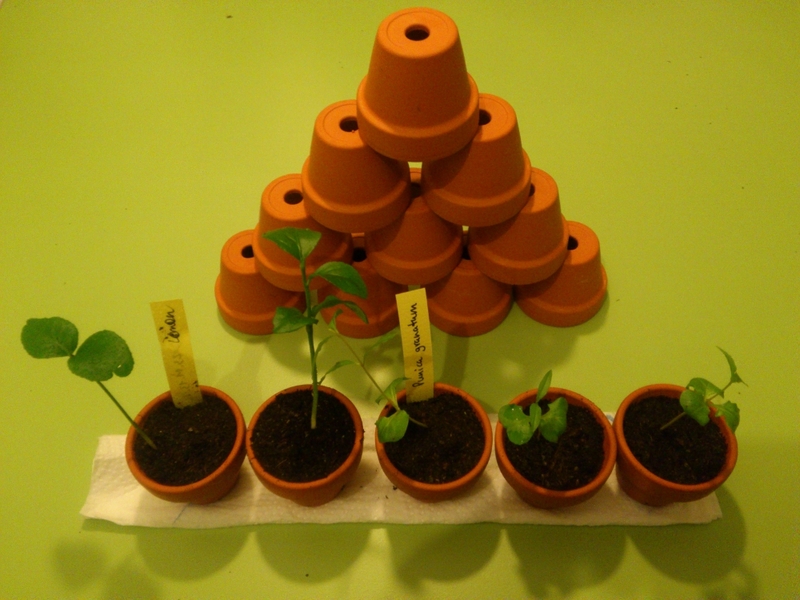 One of my co-workers wants some of the seedlings (stone pine and ginkgo so far), so I prepared them for her. I got some bonsai soil, too, because she wants to give it a try and I will need it anyway. The pine seedling on the photograph is the one from the video. One of the Granny Smith’s Apple seedlings came out nice after the first pruning, so I’m keeping it as well. I had actually planned on sowing rapini (broccoli raab) – I had ordered some seeds and they had arrived yesterday – but the sowing period is July to September. What a disappointment. Re-pot it despite its young age and to make it the protagonist of my next time-lapse video. 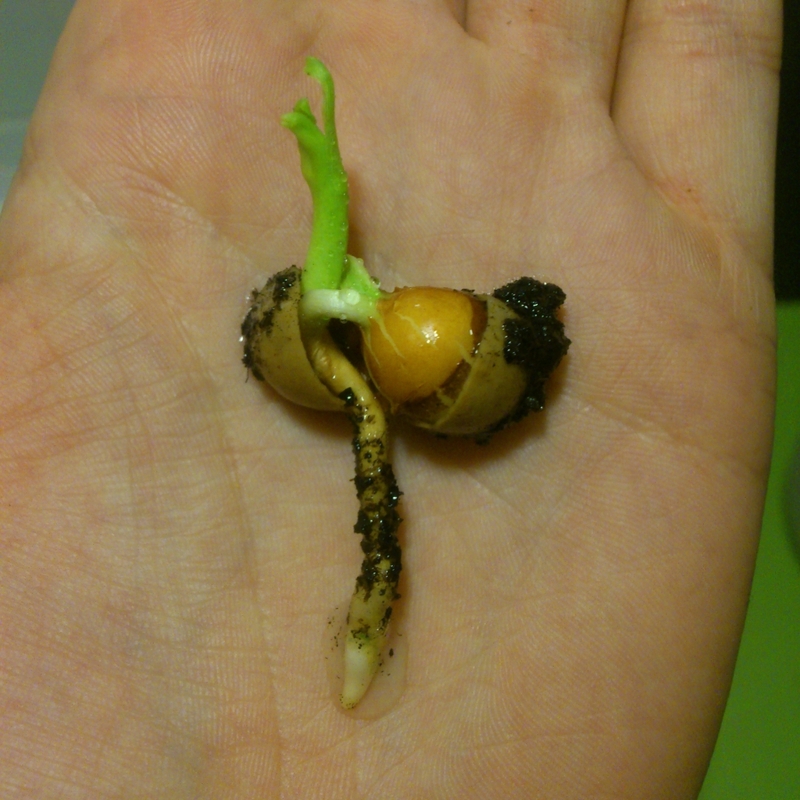 The re-potting gave me the opportunity to take a picture of it in its full dimension, roots and ginkgo seed and all. 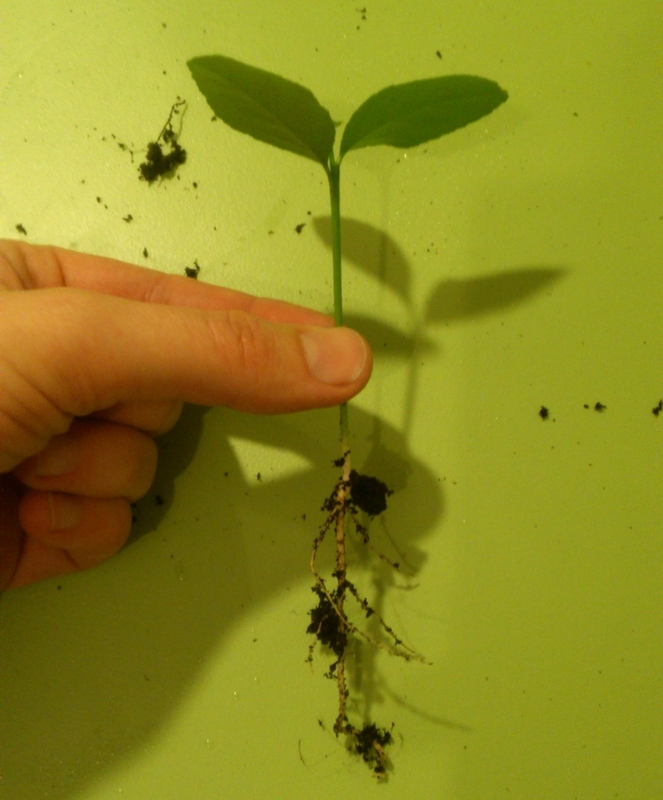 And quite a strong root it has compared to lemon trees, for example. Then I set upon arranging for the next time-lapse video. 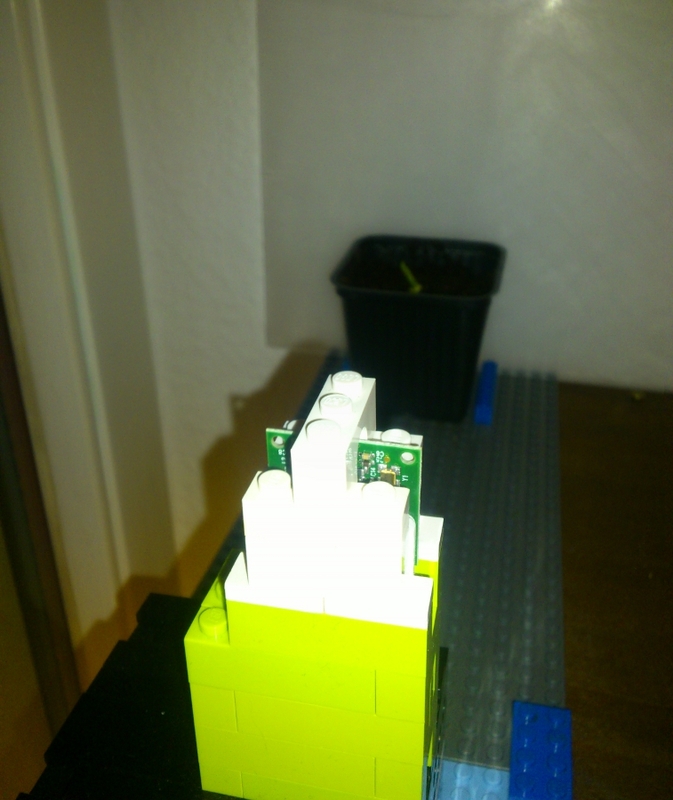 Made some place for the ginkgo pot and the Raspberry Pi with the camera module. This time, I tried to get a better image section right from the start. 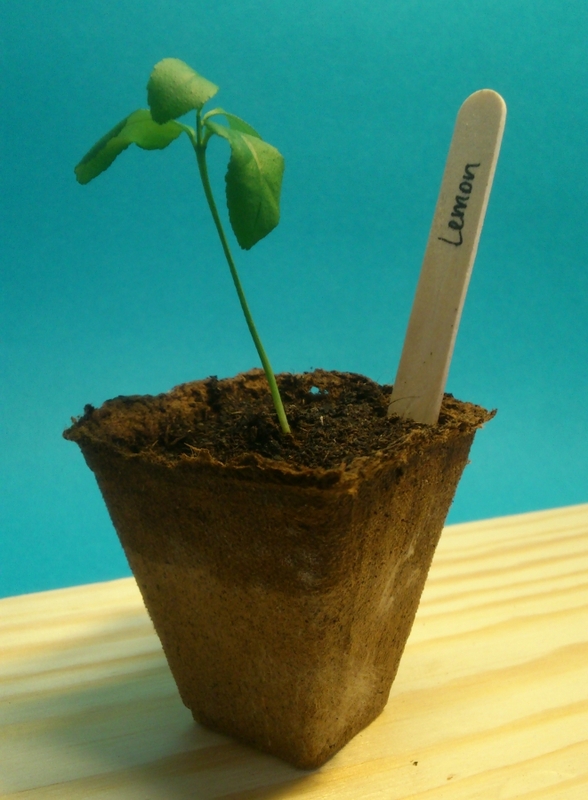 Last time, in the time-lapse of the lemon seedlings, they grew to tall for the section. I encountered a bit of a snag when I entered the source code into the Raspberry Pi command console: I wanted to take pictures for 40 days, but apparently somewhere between 21 and 28 days, there’s a limit. So I settled for 21 days. However, I have already made a note in my calender 21 days from now to restart the sequence. A picture will be taken every 2 hours. Got my clay pots from Ebay today. So beautiful with their warm, brown colour. It’s funny how with lemon trees, the leaves sometimes grow in perfect symmetrical pairs and sometimes not. I have to say that I am disappointed in the bio-degradsable pots I used for some of my seedlings. The soil is always drier than in the plastic pots which means more watering and at the same time the pots are always moist and have started to mould. I had anticipated that, because they are bio-degradable after all. Some of the lemon trees, like the one in the picture, still seem to need more water. I put most of them into plastic pots now without removing the bio-degradable ones. Unfortunately, I have run out of plastic pots. 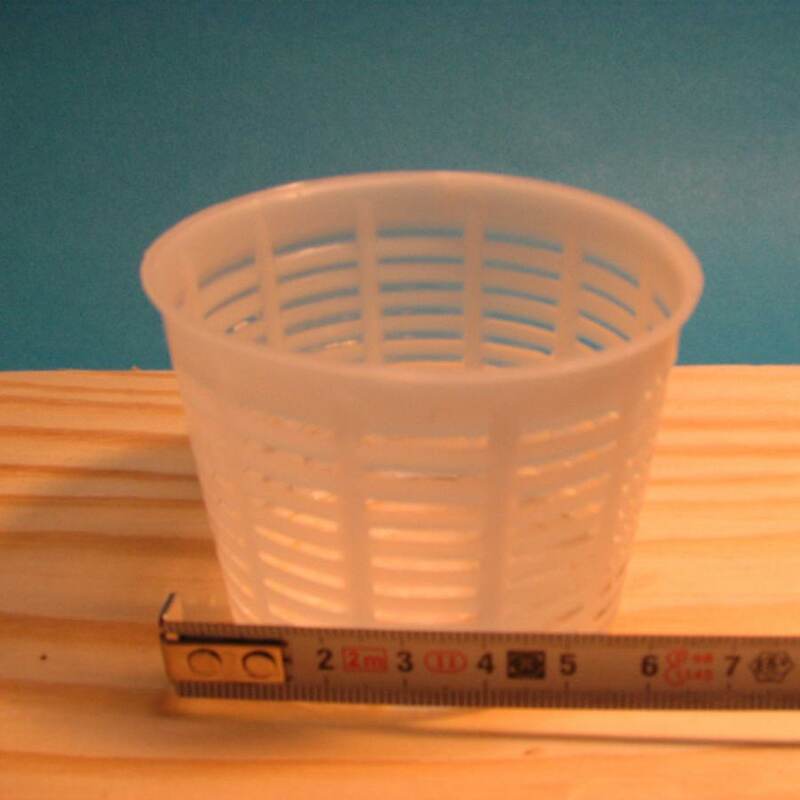 I checked Ebay for small ones, but decided for 15 clay pots, which only have a diameter of 4 cm, but they’re more environmentally friendly than the plastic ones, I guess. I suppose the bio-degradable pots are okay for getting vegetable seeds to germinate (like pepper or tomatoes), but not for keeping seedlings inside for a longer period of time. Maybe, to long-time gardeners, that was obvious from the start, but I want to give everything a try and make the experience myself. 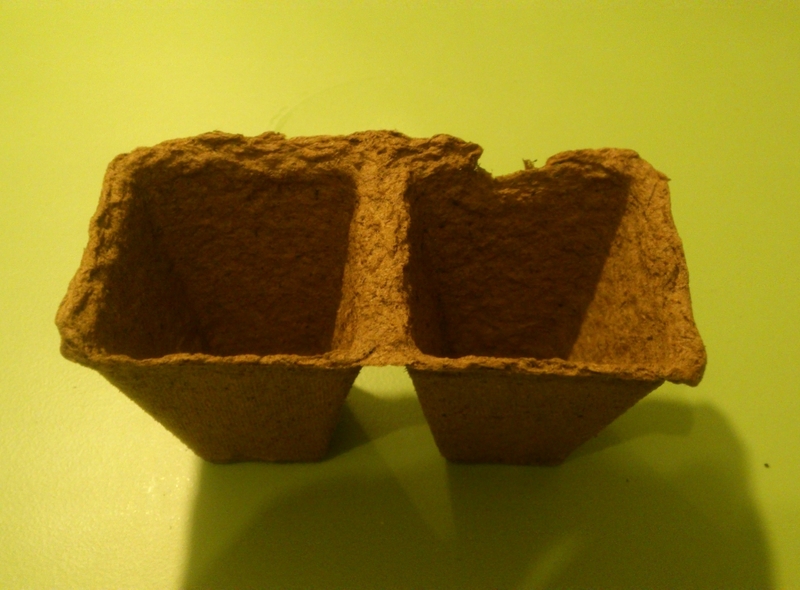 I like those bio-degradable pots. For one, they’re not made from plastic and their colour is kind of earthy and warm. The black plastic pots might have the advantage of turning the sunlight into warmth better and even storing that warmth a bit. 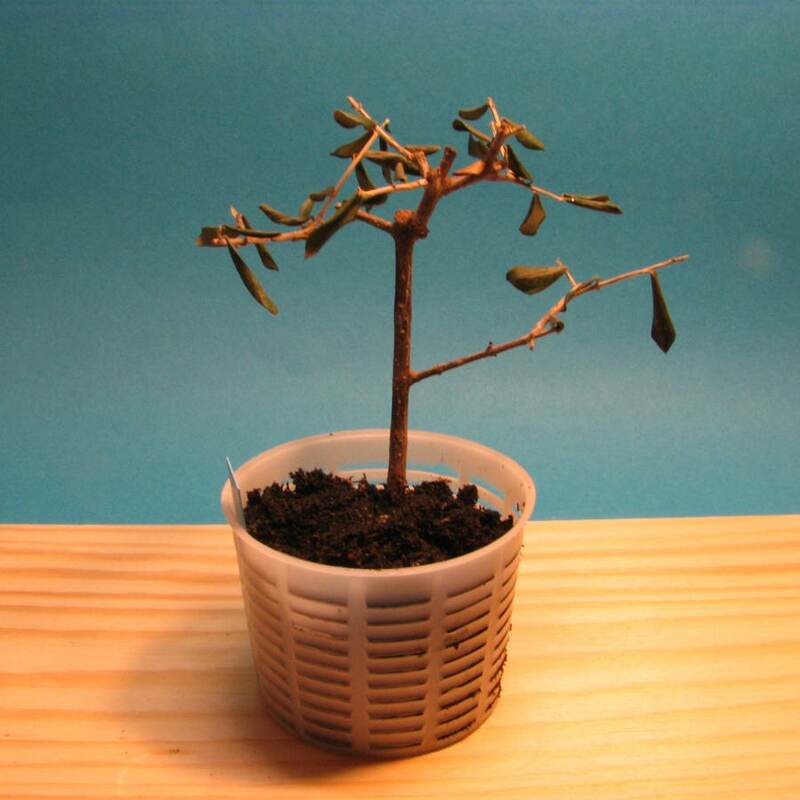 The greatest advantage of the bio-degradable pots might as well be their greatest disadvantage: They’re bio-degradable! Who would have thought?! No, seriously, you don’t need to remove them for re-potting, they will degrade in the next pot. I’m just afraid that they will start degrading before their time because of the watering…For me, another advantage though is their size. Because they’re slightly smaller than the plastic pots, I can get more of them into the platter (is that the right word? the green bottom of my mini greenhouses). 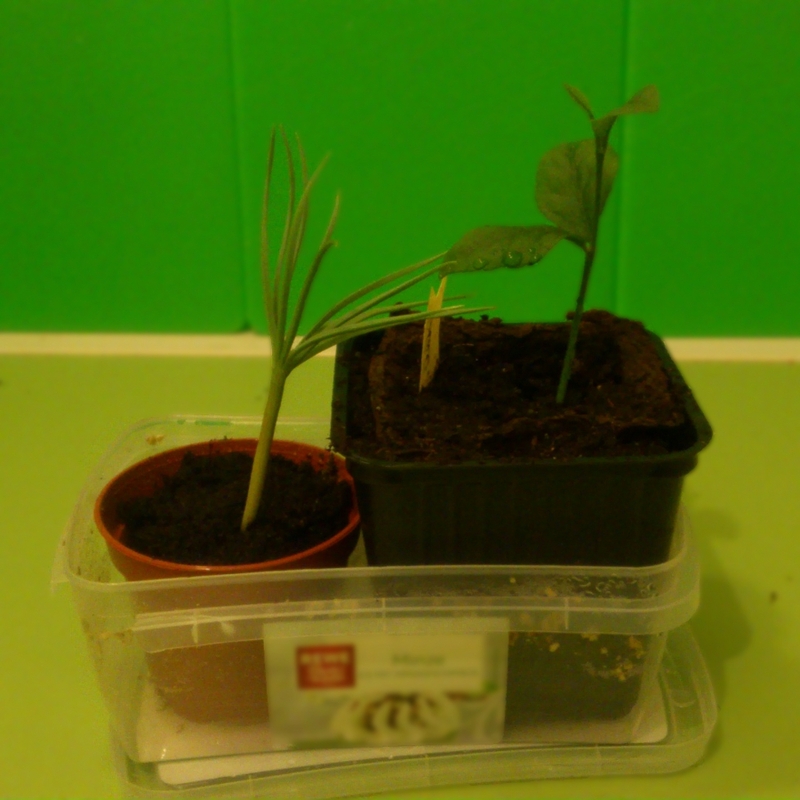 Anyway, I will keep the plastic pots, in case I want to give the seedlings away next summer. I have way too many.